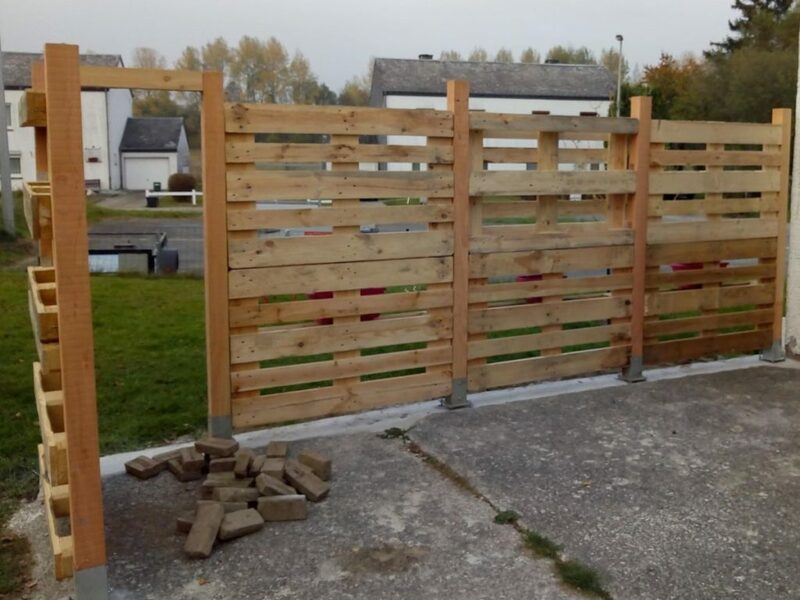 Craft smart and ecologically with pallets! The recovery has become trend in recent years, especially in decoration. Plastics, fabrics, metals, wood and other materials need only your imagination and a little DIY to find a second life. Thanks to this activity, you do not necessarily need a large budget to get a great decor in your home. Pallets may be subject to many diversions. Here are some ideas you can use to create original furniture or decoration at home! Instead of buying new wooden planks for create your furnitureyou can recover industrial pallets or get new pallets. For the interior decoration of the master bedroom, you can make an atypical headboard. For this you only need one or two wooden pallets. Then get some do-it-yourself tools and paint if you want a colorful headboard. You can place them vertically or horizontally, depending on the effect you want to create in the room. To minimize your expenses, know that you can also design a bed with this type of pallets. It's easy: put the pallets on the floor and fix them together to form the bed base. The height and length of the bed will depend on the amount of pallets you will use. You can paint or keep their original color for a more natural style. Place your mattress on it and you get a nice bed with character. Using only one side of the palette, you can design a pretty coat hook to hang your coats, hats and bags. For your living room or other room that welcomes guests, you can easily divert wooden pallets to become eco-friendly and trendy furniture. In one spirit, you can use palettes to create your coffee table. To do this, stack two pallets and place a glass or plywood panel over it. You want to create a TV stand with various storage space for your magazines and DVDs? Have four or six pallets that you stack on top of each other, depending on the height you want. It is advisable to paint this creation so that it can blend more easily into your decoration. In white, she will reflect the light in the room and offer an interesting demarcation. Placed side by side, you can glue or nail the pallets together vertically. If you have the time, you can also dismantle the pallets to create asymmetrical shelves. do not forget to sand the wood with sandpaper to avoid splinters when handling the palette or using the library. You always need furniture to store your shoes, books, bottles, etc. 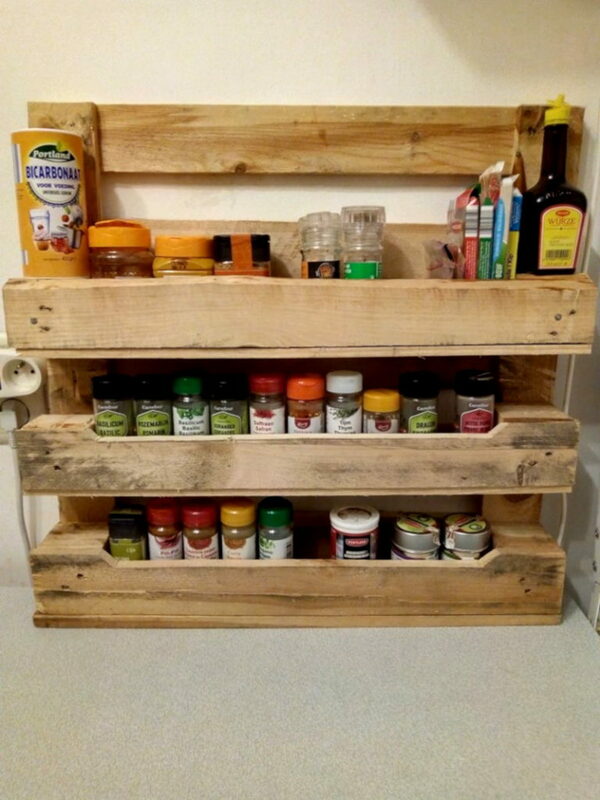 Instead of spending a hundred euros to buy a new item for your home, you can count on the pallets recovered to create one or more useful storageHere is a spice rack made with an 1 / 2 palette and 3 boards. You can then put your shoes in your custom storage. To make it easier, you can also use two pallets to get a shoe rack. This type of storage is ideal to save space in your home. 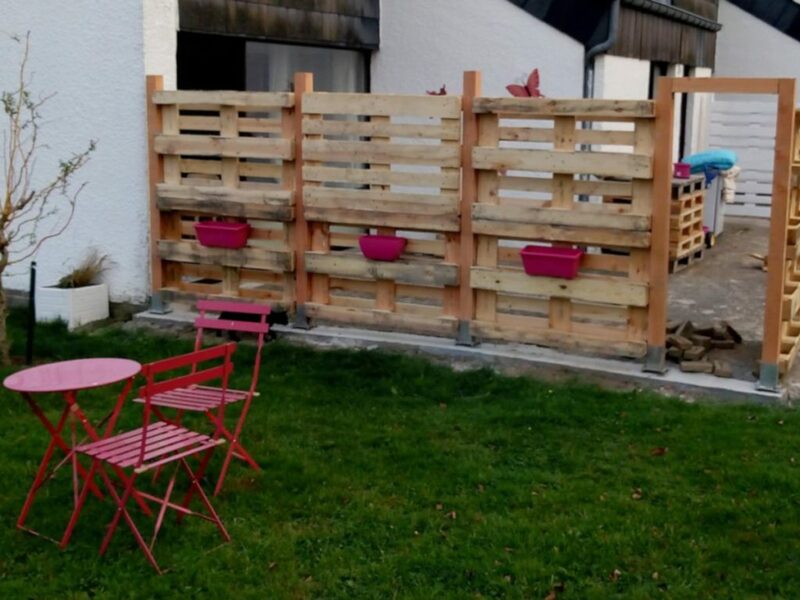 New or recovered pallets can be used to create different things, whether for indoor or outdoor use. You have a nice garden, but you can not enjoy it because of the neighbors? Reduce the vis-à-vis while building a palisade or a screen in pallets of recovery. You can also design pretty sofas, armchairs and garden tables with painted or varnished wooden pallets. Then put cushions on top to make the seat even more comfortable. 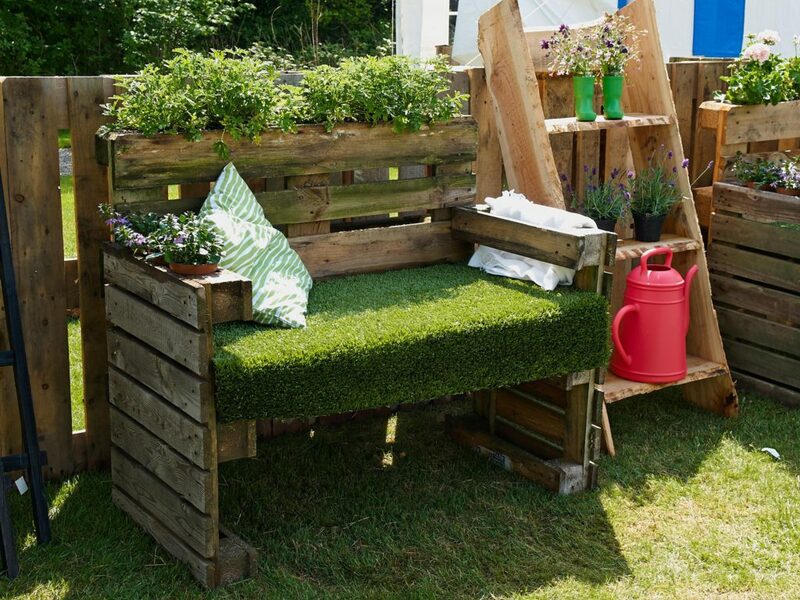 Get a charming outdoor decoration using recycled or new pallets. In a corner of the terrace or under a specially designed parasol, you can create a lounge area where it will be good to rest or to receive friends. These materials can also be useful for making shelves for your small flowerpots, storage or workbench for your DIY or gardening tools. 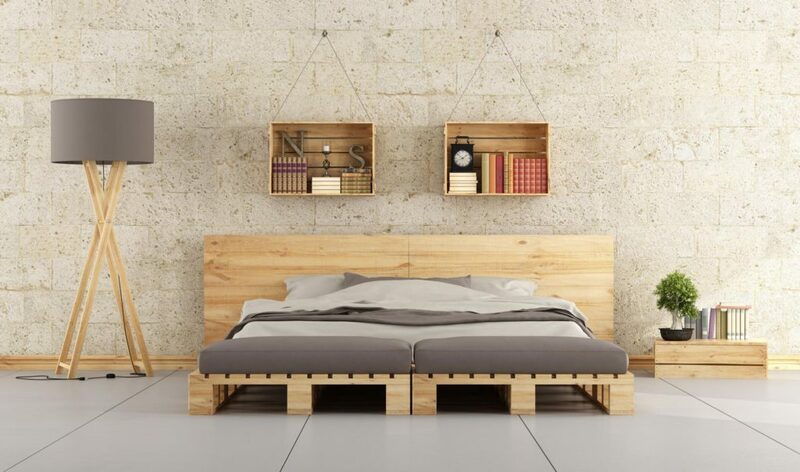 Using pallets to design furniture or other objects of the house is now very trendy for different reasons. First of all, it's economic the fact that the material is sometimes obtained free in supermarkets or at a low price in a hardware store. Then it is a very ecological recovery system since you participate in the recycling of wood. However, it is important to check certain points before using them for furniture or decoration. It is advisable to favor single-use pallets that are raw wood, thinner and lighter. If you use industrial pallets, it is advisable to check the indications they present. You will know their origin and the type of treatment they have undergone. If it has the mention "HT", it means that it has been treated with heat. She is safe for the man. If, on the contrary, you see the word "MB", forget about these pallets because they have been treated with toxic gas, methyl bromide. Afterwards, make sure that the condition of the wood can withstand the hijackings you want to make. If the wood is too damaged, or even rotten, you may lose time designing a bench that will break as soon as someone settles there. Check beforehand if the pallets are not stained to reduce as much as possible the work to be done. You can also simply buy new pallets in store for only a few euros. Some shops will also offer you pallets already used at a reasonable price. You can also use pallets to make more complex crafts like this bat shelter in Euro pallet recovery which is extremely robust and durable: it weighs more than 40 kg!